Elico is controlled by Mylene of Vexos. He's pure strength and brute force, with defensive spikes sticking out of his shoulders and knees and six tentacles that attach to his back and can wrap around his battler's arms and legs to render the battler defenseless. Elico can breathe under water. He has a large, golden diamond that shoots a water blast to defeat his opponents. On Elico's forearms are six blades used for attacking enemies and protecting his arms. 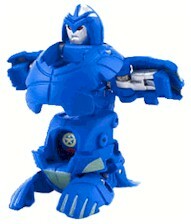 Purchase your Bakugan Elico from Amazon now!